Have you ever wanted to know what the daily routines and rituals are of your favourite creative minds? This great Info graphic by Info We Trust shares with you, the daily habits of some of the most creative successful authors, politicians, inventors and entrepreneurs. Just note: If you would like to zoom in on the picture just click on the pic for a larger size view. I find it interesting and practical that many of them are focusing on only a few things and they all rest! Thanks for sharing bro! This is seriously amazing information you’ve pulled out of your hat. I know you won’t tell… But I would love to know where you got this information from and how you know it to be true. He got it from infowetrust.com! Habits are the key cornerstones to uber success. Habits are those little energy bolts of action that propel you closer to your goals. A majority of the super successful high achievers in the world credit the daily habits they implemented towards their success. So what are the top success habits? We decided to flip one of our articles: 10 Powerful Habits of The Ultra Successful and turn it into an easy to read and visually appealing infographic. From the Ambani’s in India to the Villa Leopolda in France, we share with you a nifty little infographic courtesy of DoMyOwnHomeLoan that covers the Top 13 most expensive homes in the world. The Ambani’s come out on top with a home worth $1 Billion which Mukesh Ambani calls “Antilia”. $1 Billion is just a drop in the ocean for Mukesh who has a networth of $22.6 Billion. Checkout the 13 most expensive homes in the world right now below. The tech world is full of many smart and successful entrepreneurs, and many among those ranks had reached billionaire status. And although it seems the majority of tech elite have made their way to Silicon Valley, many of these billionaires come from around the world. The team at WhoIsHostingThis is taking a global look at a handful of tech billionaires, from China to India to Russia and beyond, in their latest infographic covering such billionaires as Azim Premji, Sergey Brin, Shiv Nadar and more. 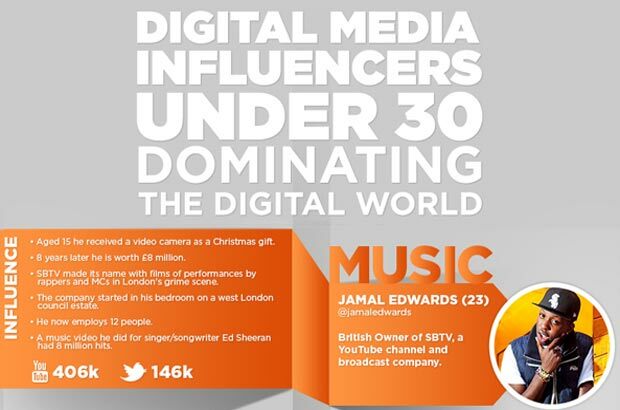 This infographic looks at the top digital media influencers under the age of 30 in the digital world right now. These are young men and women who are dominating their industry, valued by a close knit community and who above all know their niche and their audience. If you have ever thought about launching your own YouTube channel but felt like maybe there wasn’t much money to make or impact in it, well this following list of ambitious and interesting Video Bloggers and social media rockstars will prove you wrong.